The Taliban's increasing use of homemade bombs and political assassinations has been responsible for a 31% increase in the number of civilians who have been killed or injured in fighting in Afghanistan this year, the United Nations said today. U.S. and allied forces in Afghanistan killed around 52 people in the Sangin District of Helmand Province on July 23 but denied it. Abdul Barg, a resident of the area insisted in a video of Rethink Afghanistan that, "the number of martyred were no less than 35 up to 50." He also related that "every family in the village was placing at least a couple of their loved ones in a bag. The UN's Kabul mission released data showing that even as the number of child causalities has soared by 55%, strict rules on the use of airpower by Nato troops has led to a 30% drop in the number of deaths and injuries caused by foreign forces in the first six months of this year, compared to the same period in 2009. UN human rights workers recorded 1,271 civilians deaths over the period and 1,997 injuries. Of that total of 3,268 insurgent forces were responsible for 2,477 casualities, while Nato and Afghan government forces accounted for 386. "These figures show that the Taliban are resorting to desperate measures, increasingly executing and assassinating civilians, including teachers, doctors, civil servants and tribal elders," said Rachel Reid, Afghanistan researcher for Human Rights Watch. 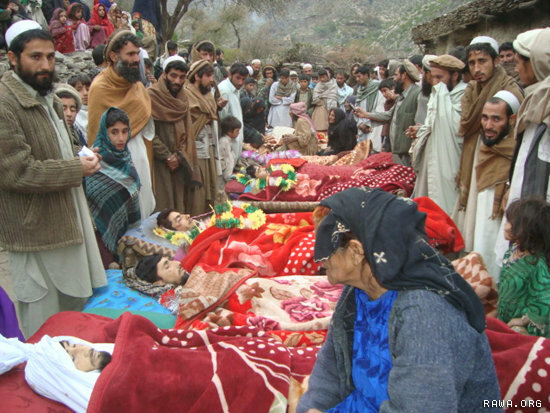 "Targeting civilians violates the laws of war, and the Taliban's own codes of conduct. Taliban leaders should immediately call off this campaign of terror against Afghan civilians". The research also highlights the remarkable turnaround achieved under General Stanley McChrystal, the former US commander of all Nato forces in Aghanistan recalled to Washington in embarrassing circumstances, who made protecting Afghan civilians a top priority, even at the cost of putting his troops at greater risk by restricting their freedom to use heavy weapons. Despite political pressure on General David Petraeus, McChrystal's successor, to loosen the rules, the new commander of Nato in Afghanistan has largely recommitted the coalition to avoiding civilian casualties as much as possible. "They are being killed and injured in their homes and communities in greater numbers than ever before," said De Mistura. Driving the overall increase in civilian casualties caused by insurgents is the increasing use of larger and more sophisticated bombs that are typically buried in roadsides and tracks to target Nato convoys and foot patrols. However, they also kill and maim civilians, including a case last month where the Taliban were blamed for planting a bomb that ripped through a bus travelling along a desert highway in southern Afghanistan, killing 25 people. The number of children killed by improvised explosive devices rose 155%, the report said. Teachers, doctors, tribal elders, community leaders, provincial and district officials have all been targeted. Nationwide, one in 10 urban households has at least one drug user, according to a recent report from the Bureau of International Narcotics and Law Enforcement Affairs.